B. Mouse anti Bovine CD4 antibody, clone CACT138A (MCA6081) followed by Goat anti Mouse IgG1:PE secondary antibody (STAR132PE). 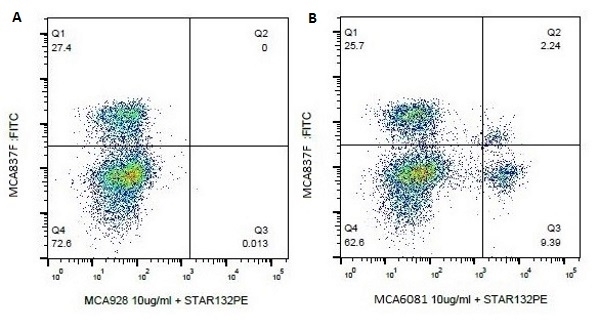 Both the Mouse IgG1 negative control and Mouse anti Bovine CD4 are plotted against bovine CD8 as recognized by FITC conjugated Mouse anti Bovine CD8 antibody, clone CC63 (MCA837F). Mouse anti Bovine CD4, clone CACT138A, recognizes bovine CD4. CD4 regulates T cell activation and acts as an accessory protein for MHC II and TCR interaction. It is a marker for bovine T helper cells. In cattle CD4+ T cells can also be found in mediastinal haemolymph nodes, lymph nodes and parafollicular lymphatic tissue (Galeotti et al. 1993). Cattle infected with viral diarrhea virus had depleted numbers of CD4+ cells (Endsley et al. 2002). Howard C.J. et al. (1991) Summary of workshop findings for leukocyte antigens of cattle. Vet Immunol Immunopathol. 27 (1-3): 21-7. Galeotti M. et al. (1993) Identification of cell types present in bovine haemolymph nodes and lymph nodes by immunostaining. Vet Immunol Immunopathol. 36 (4): 319-31.